Lesson Plans that we think you’ll find useful. The school year is coming to a close and everyone is itching for a brain break. Enjoy these four free coding challenges to get kids moving, creating and thinking about code. Three of the lessons include a sample of unplugged activities from our paid plans. Students will design, draw, & solve their own programming problems. Sample of the unplugged activity from Sequence Capstone Lesson on the Kodable School plan. Take your design to the next level. Create it in the Kodable Maze Maker! Learn about conditional statements through an unplugged game of Simon says! Sample of the unplugged activity from Conditions Lesson 4 on the Kodable School plan. Flex those muscles! Create a fun fitness routine to help the fuzzFamily. This is a sample of the unplugged activity from Functions Lesson 1 on the Kodable School plan. Create a repeating fitness routine using functions. Get active! Try out your routines! School is coming to a close, but learning doesn’t need to! Celebrate student progress & encourage them to set a coding goal for the summer. 5 Ways to Blast Back to School with Kodable! A new year is here! We hope you had a great time chillaxing by the pool. It’s time for another great school year. Kodable has tons of resources to help you get ready for the new year of teaching coding to your class! Inspire coding excellence. We have dozens of images, posters, and coloring sheets to decorate your class. All the resources you need to tell your school community about your plans to help your students learn to code are included in this post about “5 Tips for Back to School Night”. Whether you’re new to Kodable or returning for another year of coding in your classroom, Brie Gray is here to help you have a successful launch! Brie walks you through setting up your classes, teaching your first lesson, assigning content to your students, as well as recapping some improvements we made over the past year. The wise and wonderful Brie Gray prepared three lesson plans specifically for introducing your students to your classroom and to prepare them for your management style. Parents are an important part of your classroom culture. Help them understand what their child is learning and why it is important! Build Classroom Community with Coding Team Builders! Back to school means old faces, new faces, and getting to know each other in a new classroom community. We know fostering collaboration and building an emotionally supportive environment positively impacts academic achievement and developing a community from the start is key. Team building activities that promote critical thinking and collaborative problem-solving are a great way to kick off the year with your students and develop a strong sense of community that works together from day one. Traditional team builders like “The Human Knot” are great, but what if we could use coding and computer science concepts to get to know each other? In programming, variables store information in a program. The information is referred to as values, and can be either text or numbers. You can think of a variable like a container with a label that stores related items inside. A string is a variable that stores values that are groups of characters, like a word or phrase. A great example of a string variable is a name: a name is a value that is used to identify a person. Name Games: Back to school name games that help students get to know each other are a great opportunity to introduce string variables. Explain to students that they represent a variable and their name is a string that is a value associated with them. There are tons of name games out there, get creative and have fun! A simple and silly name game that can get students thinking about string variables can be as basic as students going around a circle and choosing a word that goes with their name (their favorite food, sport, a rhyme, or a letter that matches the first letter in their name). For example, “Ashley Apples” or “Mike Bike”. Everyone says their own name and the names that came before to help get to know each other! Integers are values that are written and stored as numbers. Integers are variables that store values just like strings, only the values are numbers and not words. Paper Bag Share: Each student has a paper bag and labels the bag with a word or topic that describes something about them. The topic must relate to the student and needs to be something expressed in numbers. Get students thinking about things they have that will tell a little bit about them. An example would be labeling the bag “Siblings” or “Pets”. Students would write on a piece of paper how many siblings or pets they have (0, 2, 4, etc.) and place the value inside the bag. You can have students choose any topic to represent a variable and have them place a related value inside. Arrays are ordered lists of variables that include both strings and integers. Arrays keep related values organized and in a specific order. Time Capsule: As a class, make a time capsule for the year that represents an array. Students write down their expectations and goals for each month of the school year on separate pieces of paper. Students place each of the 10 “values” inside the time capsule in order from September to June, keeping the values organized chronologically in the time capsule. Classes hold information about an object and allow us to create new, individual objects based on these details. A helpful way to explain classes and objects to students is to think of basic classification: grouping objects based on their similarities and differences. Activities that allow students to explore their similarities and differences will help students understand classes and objects in programming while getting to know each other. Properties are special types of variables that are attached to an object and describe it. Students can think about themselves as an object and things that they have as properties. Any team building activities that allow students to describe themselves and each other will help students understand properties and objects in programming. Like what you see or have ideas? Leave it in the comments below! Code your Back to School Procedures! An elementary classroom without clear procedures for daily routines means chaos. As you head back to school and get your classroom operating like a well-oiled machine, consider including some coding concepts to make it fun and frontload computer science lessons you’ll teach later in the year! How do classroom procedures relate to coding concepts? Every transition throughout the day requires clear, rehearsed routines that keep everyone safe and in an efficient learning environment. Procedures help us avoid wasting precious time, keep students on track, and allow for 30+ humans to function together in one room- a miraculous feat when you think about it. Procedures require order, rules, and often silly names that direct students to perform a certain set of actions (think “Criss-Cross Applesauce,” “Put a bubble in,” etc.). These are all elements of programming concepts used in programs to direct a computer to carry out tasks- making them perfect examples of how we can relate programming to real life for our students. We know that in programming, sequence is the order that commands are executed by a computer which allows us to carry out tasks that have multiple steps. In programming, we direct the computer to perform multiple steps in the correct order and it allows us to carry out a task. In the classroom, students have to perform multi-step tasks as well, such as washing their hands, transitioning to lunch, or coming in from recess. Think about some routines that are specific to your classroom and how they are a sequence of steps put together: this is just like how a computer carries out tasks and will help students understand this process for computers. In the classroom, students experience conditional statements daily as they follow classroom rules and guidelines (or break them!). Using conditional statements will help students think about and set classroom norms together, and make conditional statements easier to understand in programming down the road. Integrating conditional statements into classroom procedures will help students understand how stories can alter and the role programmers play in changing a computer program’s path. In programming, a function is a named sequence of steps that can be reused and easily called on over and over again. Classroom management strategies are a great example of a function: teaching students a sequence of steps and giving it a silly name that you can say without having to direct students through each step in the process, every time. In the classroom, functions can be a lifesaver! Getting students to do a series of tasks in one motion by calling out a name can keep things in order and on task; which is what we all want for a productive learning environment. To help yourself understand the programming concepts and how they can be used with your back to school procedures, watch our videos and share your ideas in the comments below! The most important lessons we learn in life center around social-emotional learning and becoming safe, responsible, and respectful adults. As 21st century citizens and learners, it has become essential for schools to teach social skills that will keep students safe online and allow them to thrive as learners using digital tools. Not only will it double as a team-builder and improve your classroom culture, but teaching a lesson on digital citizenship without being online has huge benefits when students eventually get online. Just as you would define clear routines and structure in your classroom, the online classroom needs the same level of attention. Priming your students for what’s to come will prepare and excite them when it’s time to try out that new program, app, or online lesson. Engage with your students in a class discussion around safety in real life. Get students to think about how they are safe, responsible, and respectful when face to face with others. This will help them understand the internet as a giant collection of very real people and things (including consequences); even though they can’t always see what’s on the other side. Although the need to explicitly teach digital citizenship is recent, there are already resources just a few clicks away. Some awesome teachers have shared their digital citizenship lessons on personal blogs, and there are even companies working to create material that saves you the planning time. Check out one of our favorites, Common Sense Media, which will give you access to all of the materials you and your students need to stay safe online- for free! The internet is an amazing resource, and we’re seeing students rise to new levels with access to so many programs and opportunities. As educators, it’s our job to teach our students how to live in the digital world and make sure the internet continues to be a place they thrive. Have ideas or opinions on digital citizenship? Leave it in the comment section below! Earth Day is quickly approaching. We can all take advantage of this chance to highlight what it truly means to take care of our planet. Particularly in a time where every day seems to bring a new challenge for the human race. There’s something extra special about seeing our students excel as human beings as well as academically. The proudest memories I had as a teacher go far beyond my students growing 3 grade levels in reading in one year. They include the not-so-small moments when I saw my students becoming awesome people. Empowering our students to shine outside of the classroom is essential. It is also an excellent application of the critical thinking and problem-solving mindset we work so hard to cultivate. What on EARTH does this have to do with coding? Share stories of inspirational (kid!) innovators. This is a great way to cover some Common Core ELA standards, depending on what grade(s) you teach! Have students research and present on green energy and green technology inventions- we particular enjoy some of these kid inventor’s ideas. If you’re up for renting or purchasing, check out the Code Girl documentary with a wide range of inspiring ideas to better Earth and humanity. Use current events to encourage and inspire. Share relevant issues that our Earth faces, tastefully presenting global issues that we can work together to solve in small (or big!) ways. Some great places for kid-friendly current events are here and here. The National Education Association also has awesome lesson plans and activities that address current issues. Present an issue that Earthlings face today (one your students can understand and think critically about). Challenge students to apply the 4 Cs to come up with a creative solution—let them run with it! 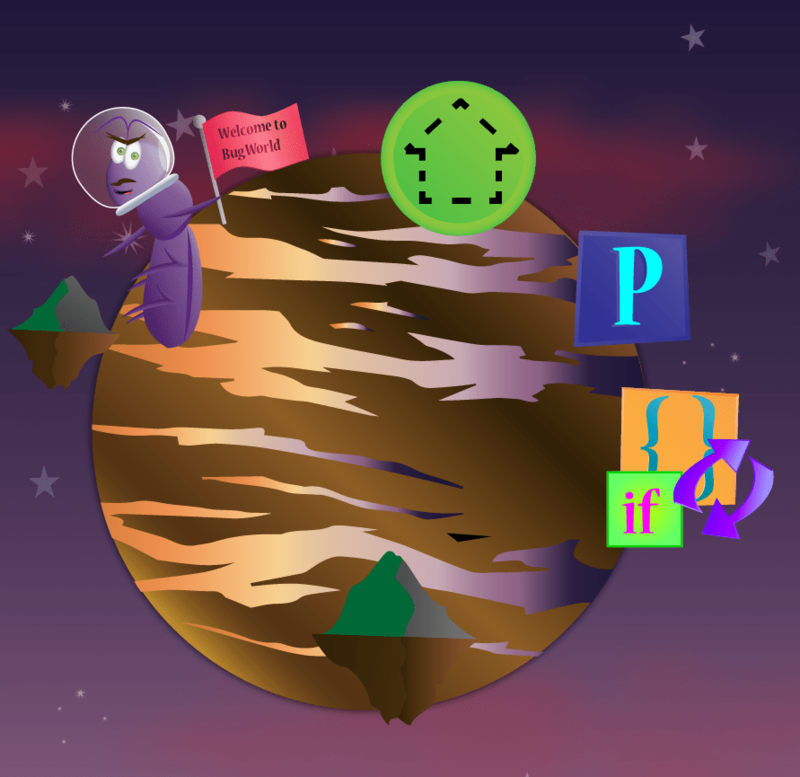 For Kodable’s Earth Day coding challenge, get our lesson plans and activities! Caring for our planet is a responsibility we all share equally; one that holds us together despite our differences. As we look to better our planet, there is nothing more important than each of us sharing our talents and ideas in a productive way. Imagine what we can do by sharing, listening, and learning from each other? Try some of these awesome Scholastic team builders to promote working together on Earth Day and every day. “Recycled Goods” is great for PBL on Earth Day! Whatever you decide to do on Friday, Aprill 22nd to celebrate our planet with your students, we THANK YOU for equipping the future with humans who will have the skills needed to continue to innovate, invent, and take us for many more wild trips around the sun. We want to hear and share about your Earth Day festivities! Send pictures, artwork, and activity ideas to brie@kodable.com.